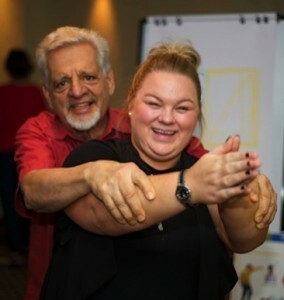 Anna Mitchell, a licensed Brain Gym Instructor and course sponsor in Dubai, volunteering to help me demonstrate the partner version of the Calf Pump for ease of focus and attention. 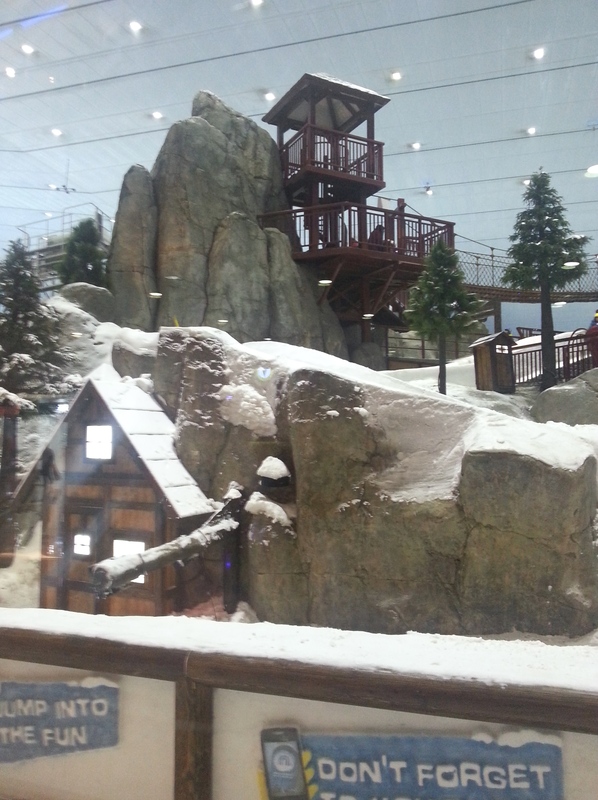 The amazing Ski Dubai—a snowy indoor ski lift and slope within the Mall of the Emirates—one of the world’s largest shopping malls. 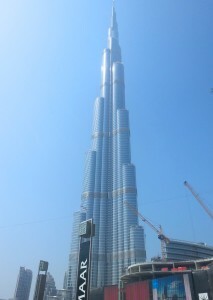 My photo of the tallest building in Dubai—the Burj Khalifa, which rises an imposing 2,717 feet to hold 209 floors. Imagine a faraway, almost mythic place—an enormous global city with impressive skyscrapers and urban landscapes, unbelievably built in the middle of an arid desert. This growing, dynamic environment cries out for exploratory thinking and a belief in new possibilities. Now imagine a group of inspired adult students coming together to discover what it’s like to “move to learn”—to set new life goals and embody vital new ideas and habits through balance and play. This was the context for two of my fall 2015 courses: A gathering of eager learners and leaders coming from across the Arabian Peninsula to the mysterious city of Dubai, one of the seven United Arab Emirates, situated on the southeast of the Persian Gulf coast. 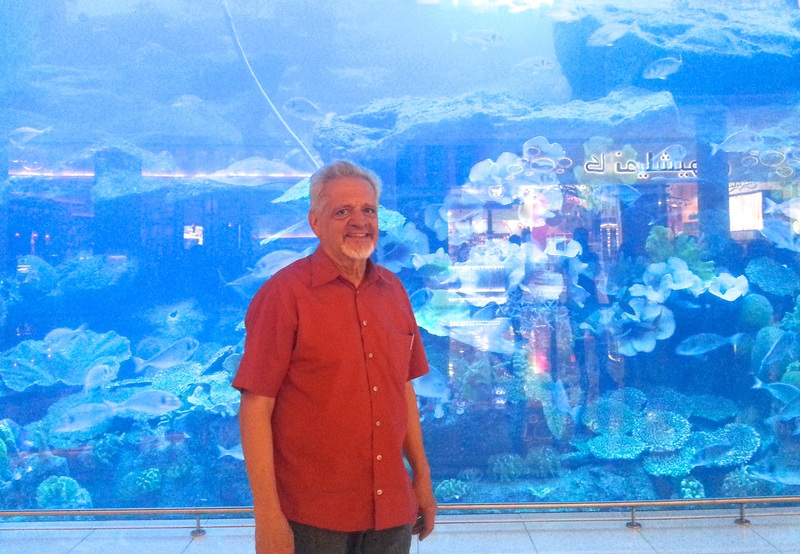 Behind me, a small glimpse of the Dubai Mall Aquarium, one of the largest tanks in the world. 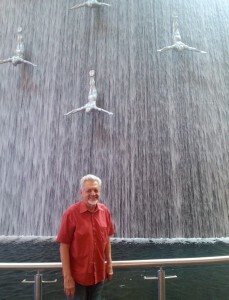 At the Dubai Mall—like something I’d never seen before—a sculpture of divers as part of a waterfall. 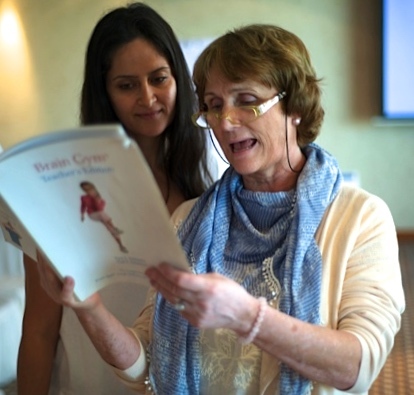 The Dennison Approach to Whole-Brain Learning was attended primarily by parents and educators, including some participants who were new to Brain Gym*. We enjoyed moving, playing, and balancing* together as students learned the 26 Brain Gym activities and experienced how each supports centralization of eyes, hands, and body on the midfield for such varied tasks as sitting, standing, walking, and academic work. A student and I enjoyed the benefits of the partner Calf Pump. Here, we positioned ourselves to anchor one another in the partner version of the Grounder. Drawing on my studies in child growth and development, as well as my clinical experience, I demonstrated how each Brain Gym activity supports specific physical skills basic to ease of functional learning. 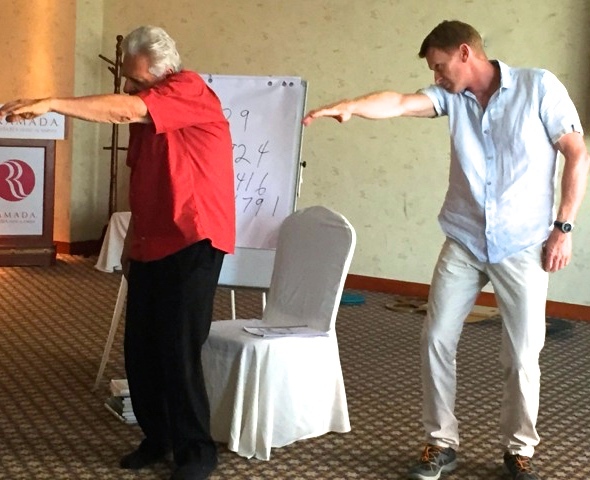 Participants then experienced for themselves how crossing the lateral midline connects the body’s left and right sides for the mechanics of communication, such as reading, listening, and writing. We next explored the relationship between up and down movements and our ability to be organized and grounded, and to manage stress. Lastly, we crossed the focus midline, moving both forward and back, to experience how our focal and ambient awareness can impact our ability to plan ahead for ease of comprehension. Participants were delighted to discover processes that they could immediately implement for themselves, as well as with youngsters and oldsters at home and at their schools. We did the Elephant to relax neck and shoulders, and connect with our depth perception. We enjoyed the rhythm and flowing motion of the Alphabet 8s activity. This kinesthetic, whole-body experience of the alpha and beta letters as more alike than different also highlights letter distinctions. Students noticed differences in their reading fluency before and after doing each balance. 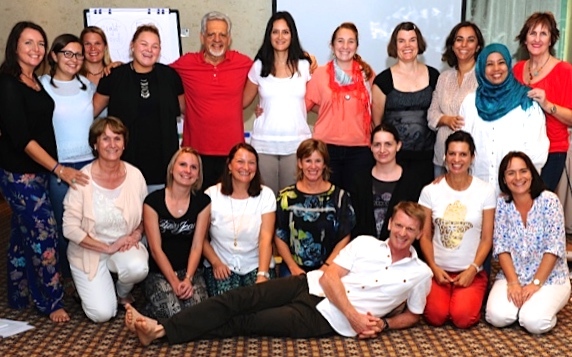 Course photo for Dennison Whole-Brain Learning; I’m in the back row center; Anna is far right. After a day off and more touring, we continued with Total Core Repatterning**a post-graduate Edu-K In Depth course focusing on integration of early motor skills. The group was made up of advanced students—some chiropractors, physical therapists, Touch for Health instructors, and numerous Brain Gym instructors who were already familiar with the educational model of creating a “big picture” context through which to draw out new learning. As a group, we identified some basic one-sided habits of movement (such as reading, writing, texting) and noticed how these interfered with eye-teaming, as well as how they diminished our work skills and structural alignment in general. We then integrated these through the repatterning process, experiencing the ease and facility possible when whole-body movement provides context and centralization for near-point activities. During the three-days, students chose goals, partnered up, and facilitated the 5-step balance* process with one another. Our in-depth activities emphasized structural alignment. We saw the impact on centralization of the Symmetrical and Asymmetrical Tonic-Neck Reflexes, as well as TMJ misalignment. The students were delighted after each balance to experience improved postural integration, a new ease of movement, and the possibility to live into their goals with greater awareness. 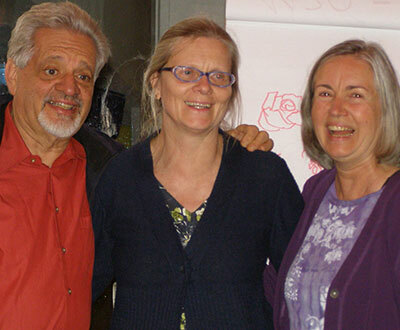 What a joy to share the Edu-K work with such eager and hospitable people. 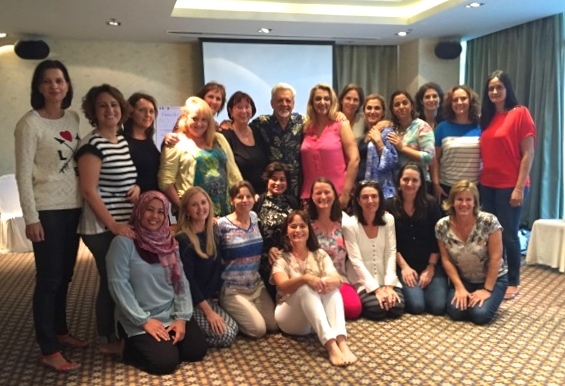 There was a strong feeling of love in the room as we worked and shared together. Our Total Core Repatterning workshop graduation photo—from our multicultural backgrounds we emerged as a cohesive community. Anna, front row center; me in the back row center. *Brain Gym courses are based on the balance process: Five Steps to Easy Learning. The Brain Gym activities are described in Brain Gym®: Teacher’s Edition, by Paul and Gail Dennison, ©2010, Edu-Kinesthetics, Inc., Ventura, CA. **Total Core Repatterning is an in-depth movement process (based on the Dennison Laterality Repatterning process taught in Brain Gym 101), for integrating primitive reflexes that interfere with learning and mature motor control. 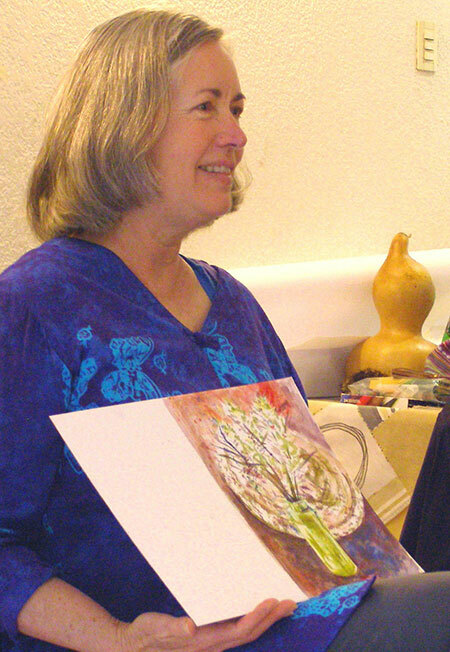 November 12: Today I received photos from a friend, artist, student of kinesiology, and photographer Christa Ostertag, bringing back memories of one of our special workshop events this year. 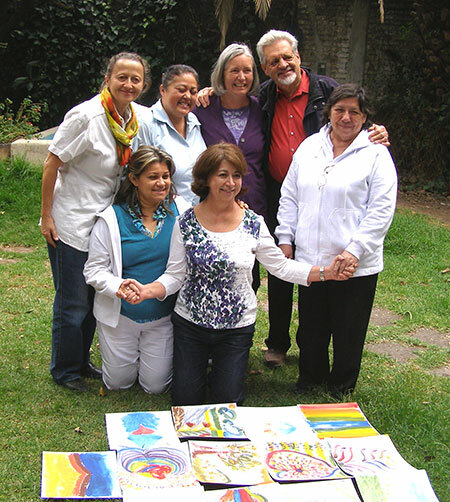 Under the sponsorship of CIKA (Centro Integral de Kinesiología Aplicada®) and organized by Margarita Ehrensperger, our longtime friend, fellow kinesiologist, and Brain Gym® International Faculty member, Paul taught The Dennison Approach to Whole-Brain Learning course to an enthusiastic group of 90 parents and schoolteachers in colorful Mexico City, followed by my teaching the Double Doodle Play and Double Doodle Teacher Training courses to dozens of Brain Gym® Instructors in nearby Coyoacan. Paul and I loved seeing the imaginative Double Doodle* images and hearing the stories created by our south-of-the border students, who had great fun using both hands together to draw and paint. Margarita has already completed her portfolio of artwork and taught her first course of Double Doodle Play—congratulations to Margarita and others who are on their way to teaching this fun and creative course! *In the 1960s, Paul learned “bilateral drawing” from developmental optometrist G.N. Getman, author of How to Develop Your Child’s Intelligence; in the 1980s, we elaborated on this playful activity and renamed it Double Doodle, including it as one of the 26 Brain Gym® activities. 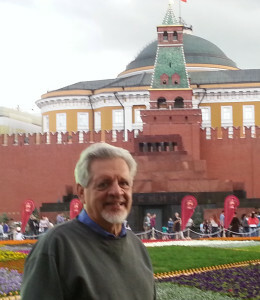 © 2012 by Gail E. Dennison. All Rights Reserved. October 28: Yesterday I taught the first day of the Dennison Approach to Whole-Brain Learning—happy to be focusing once again, after the exuberance of the last few days, on the basics of getting new students grounded and reading. In the evening, having completed a long day of teaching and a late supper, I arrived at my hotel looking forward to some deep sleep. As I still had one more day of teaching, I was surprised when the concierge asked me at what time I would be checking out tomorrow. She clarified for me that all guests would be ending their stays the next day, as the hotel was closing for a two-week holiday. 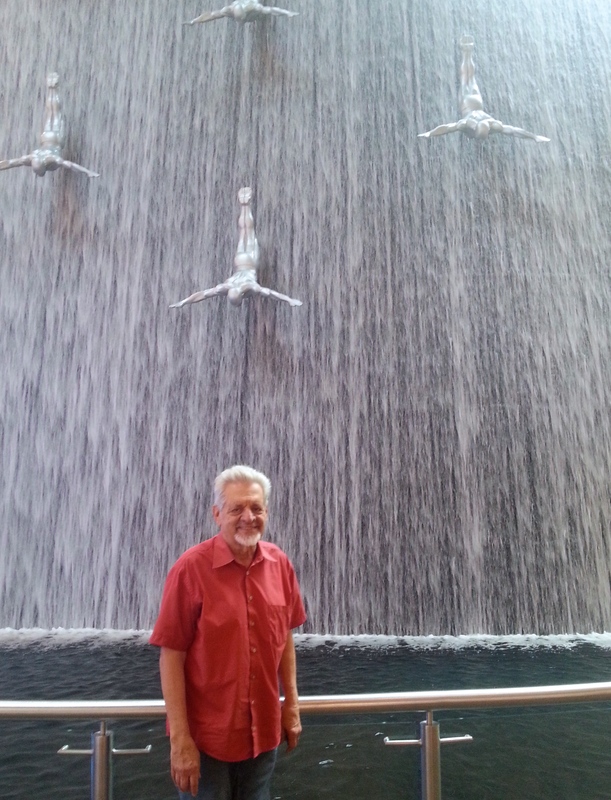 In 50 years of travel abroad, this was a first; I have never heard of a hotel closing. As I also well know, Europeans take their holidays quite seriously! Today, before class, I moved all my things to the Hotel Rosli, a charming old bed and breakfast nearby. I’ve stayed here with Gail, and we always enjoy it. This time I was in the slanted attic room, three flights up, with a tiny shower that I’ve heard stories about, so I was prepared for the adventure of bending my head down to wash. 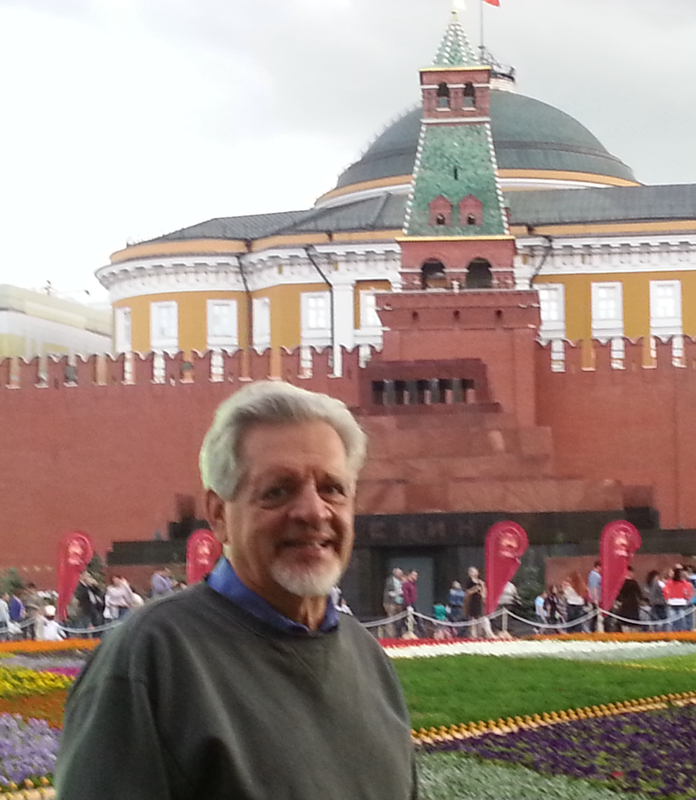 Throughout the trip, I have enjoyed the church bells that chime every quarter hour. Somehow they’re especially resonant today. (C) 2012 by Paul E. Dennison. All Rights Reserved.